Seattle politics is pretty toxic at the moment; it seems everyone is angry about something, especially when it comes to the homelessness crisis and bike lanes. That said, there are some important conversations happening right now that we all need to be well-informed to participate in. Here are some things you should be reading. A lot more happened this week that I didn’t get around to writing about. And on Monday the Mayor will release her proposed 2019-2020 budget. So before everything else fades into obscurity, here’s some quick takes on all the other stuff. Bike share and the center city bike network top the news this morning. 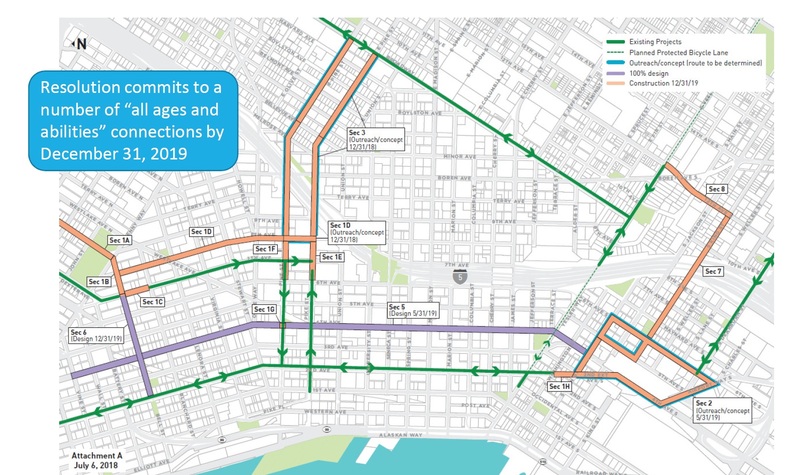 In response to outcry from the bicycle community, Council member Mike O’Brien has been negotiating with SDOT a resolution laying out a timeline for implementation of pieces of the center city bike network over the next few years. Today that resolution passed out of committee, and is headed for approval by the full Council on July 30th. A proposed expansion of the city’s bike share pilot program passed out of committee this afternoon, even though two Council members believe it still needs work. So how’s that dockless bikeshare pilot going? This afternoon the City Council heard a preliminary report on a study that SDOT did from July to December last year on the rollout of privately-operated dockless bike share programs in Seattle. This morning, the Planning, Land Use and Zoning Committee held its sixth discussion of a bill to update the city’s code for off-street and bicycle parking, and it finally rolled up its sleeves and got to work: after passing several amendments, it voted to move the bill out of committee and on to the full Council for final approval. Today the Seattle Office of the Hearing Examiner released its decision on the latest appeal of the city’s attempt to complete the “missing link” of the Burke-Gilman Trail through Ballard. The examiner affirmed the validity of the Final Environmental Impact Statement, which clears the project to go forward unless it is appealed further up the line. 2016 was not a good year for implementation of the city’s Bicycle Master Plan. But SDOT learned some lessons and is working hard to catch up and learn from what went wrong. Last week they laid it all out for the City Council. 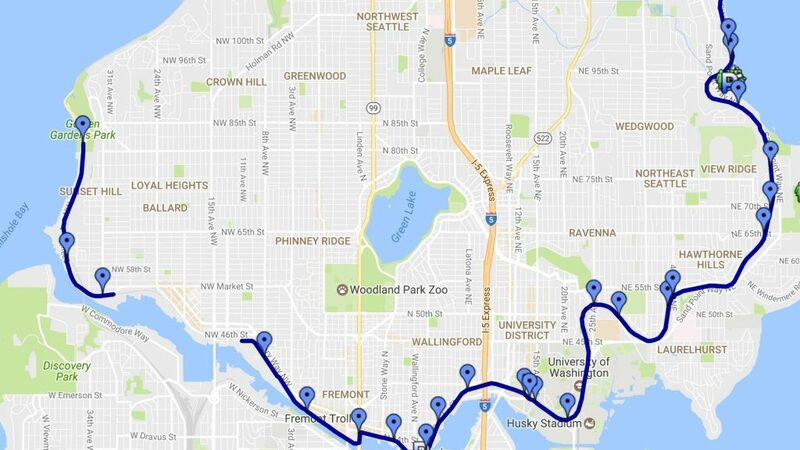 This afternoon, the city announced its preferred path for a trail to fill in the “missing link” of the Burke-Gilman Trail in Ballard.